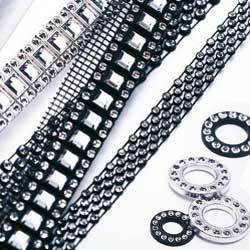 Swarovski range of Plastic Trimmings includes trimmings, bandings, and a range of deliciously, top-quality Plastic Components which are targeted at Clothing, Accessories, and Jewelry Making industries. The Plastic Trimmings are made from plastic with Swarovski crystals integrated into them. A multi-functional product. Can be hand or machine sewn, glued or mechanically applied to various kinds of materials. The Bandings offered in this range includes offerings of XILLION Chaton colour as well as casing colours. Additionally almost all Plastic Components are available in gold & silver plating. We will collect a list of Swarovski Plastic Trimings product range for your easy reference. They will be sorted by their Codes. Not every item has a name but when they do, we will include it. Click on the code-link for more details of each product article.